The Electrocorder range is designed to allow users to cost effectively monitor single and three phase loads. This product will allow single and 3 phase loading and/or balancing problems to be highlighted quickly as well as assessment of energy usage over time. 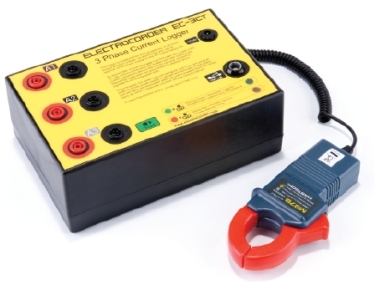 Setting up the Electrocorder EC-3CT is easy, suitable for semi-technical staff. Using the supplied (free) Windows software, Electrosoft; the location's details are input to the unit's memory and stored. Electrosoft can then print documentation allowing users to record and/or pass on delivery instructions to colleagues. All data is also stored in a database of dispatches and returns, which tracks the whereabouts of all loggers. There are many models of Electrocorder, to suit many logging situations and user's requirements. Memory modes available: The Electrocorder can be set to start recording when it is connected and the 'start' button pressed and stop when the memory is full. When recording the Electrocorder will store the average current over the period chosen (1 sec to 60 min), it will also record the highest (max) & lowest (min) cycle values during that period. The current levels are stored with dates and times. With the back-up battery, the Electrocorder can continue to record for 6 months. An external 12Vdc PSU input is available, to allow for prolonged logging without batteries. The stored data is uploaded to a PC via the supplied USB cable. Using Electrosoft, the recorded current levels, dates & times can be viewed in both tabular and graphical form, exported to a spreadsheet or saved to file. On the logger, recording is signified by a flashing green light. A steady red light advises users that the unit has completed recording. This model is specifically designed to accurately monitor one, two or three current channels. Allowing you to monitor the loading and energy consumption of the installation. Enables current or load problems to be highlighted and investigated. Allows users to accurately record load currents up to 300Aac. Records IAvg, IMax & IMin on all 3 channels. Data stored in nonvolatile memory. Memory capacity of 32,000 (true RMS) values per channel (10bit), up to 300 days continuous recording. Kit includes Logger, Carry Case, Electrosoft software, Three CTs, USB lead, 12Vdc Power Supply, Batteries. Order code 300Amp model:- EC-3CT-300-5H-KIT (50Hz) or EC-3CT-300-6H-KIT (60Hz). Order code 60Amp model:- EC-3CT-60-5H-KIT (50Hz) or EC-3CT-60-6H-KIT (60Hz). Part numbers in this range include EC-3CT-30-6H-IP43-KIT, EC-3CT-60-6H-IP43-KIT, EC-3CT-300-6H-IP43-KIT, EC-3CT-30-5H-IP43-KIT, EC-3CT-60-5H-IP43-KIT, EC-3CT-300-5H-IP43-KIT, EC-3CT-300-5H-IP43-KIT (50Hz), EC-3CT-300-6H-IP43-KIT (60Hz), EC-3CT-60-5H-IP43-KIT (50Hz) and EC-3CT-60-6H-IP43-KIT (60Hz).